Damn these enchiladas were good. Like really good. Make them this weekend and enjoy them with a beer or a green juice, whichever you’re feeling like. Enchiladas in summary, are tortilla tubes filled with a mixture of protein and/or veg, baked in a cake pan with sauce and cheese (not here though) and I think the particular sauce I used and how I cooked the tofu is what made these enchiladas stand out. I found this sauce randomly at the Whole Foods in downtown Portland by the company Native Kjalii Foods. They are native (hehe) to Northern California, so unfortunately I don’t know if this delicious brand is available outside of the northwest. This sauce stood out to me for a few reasons. They have an ingredient list to be proud of, not only will you recognize ingredients but you can pronounce them too. Although they don’t boast it on the label, their sauce is natural and free of preservatives and other strange chemicals. I was excited to see dried figs, pumpkin seeds, sesame seeds, and almonds included in the list of ingredients. What an interesting palate of flavors! Not to mention the array of nutrients, plant proteins, and fiber they boast. Upon tasting it – WOW – it holds a rich collection of flavors from the chocolaty (the best part of a mole) to the chipotle, the fig and a subtle salty kick of heat. I’m in food-love. I’m sorry if you aren’t able to try or find this. If you are in the northwest, go to their site and see if there is a store near you and if you reside elsewhere just try to find a mole sauce that is at least in good standing when it comes to ingredients and make sure it’s around 12oz. Or better yet make your own! Although, I seem to remember watching a Rick Bayless episode YEARS ago and there were many steps, if my memory serves correctly. *If you can save time by doing different steps at the same time, go for it! We have one skillet and I didn’t feel like having to wash the stock pot we have so I cooked some things separately. Add water to a skillet and heat on medium heat until it boils, add onion and minced garlic and saute on medium to low-medium heat until they get soft. About 5-8 minutes. You could use olive oil or coconut oil but I was trying out a water-saute. This worked great but the onions did leave that really thin layer behind on the pan that was hard to remove BUT it also added flavor to the tofu which I cooked next. When the onions are done, remove them to a bowl and set aside. Now for the tofu, it’s of course been pressed and drained. 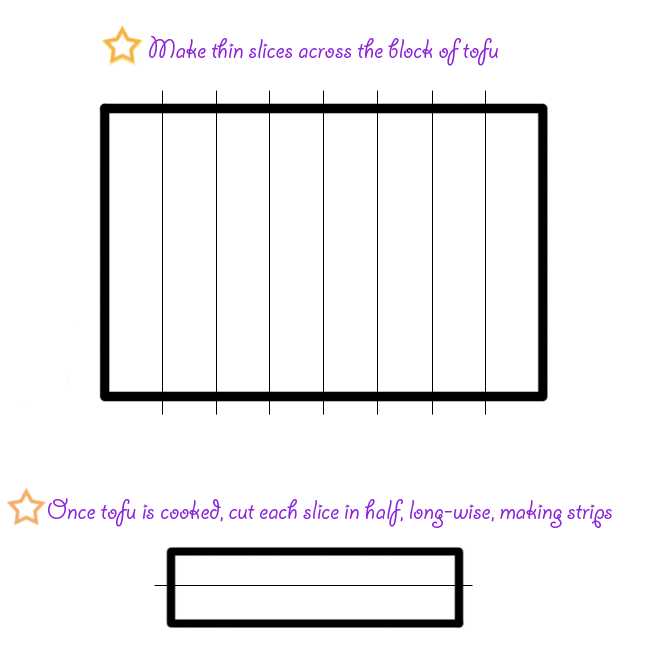 Follow the diagram and make 1/4-1/2″ slices across. Drizzle a little Bragg liquid aminos and nutritional yeast on a plate or shallow pan, place the tofu down and drizzle and sprinkle a little bit more of the Bragg liquid aminos and nutritional yeast across the top. Place a couple teaspoons of olive oil in the same pan you sauteed the onion and bring the heat to medium-high, place as many tofu slices in the pan as possible (all but 2 for me) and cook until crispified before turning over, about 5-8 minutes. Repeat for the other side and remove from heat. Once cooled, cut each piece in half length-wise, making fry sized strips. Place on a plate with the cubed potato. 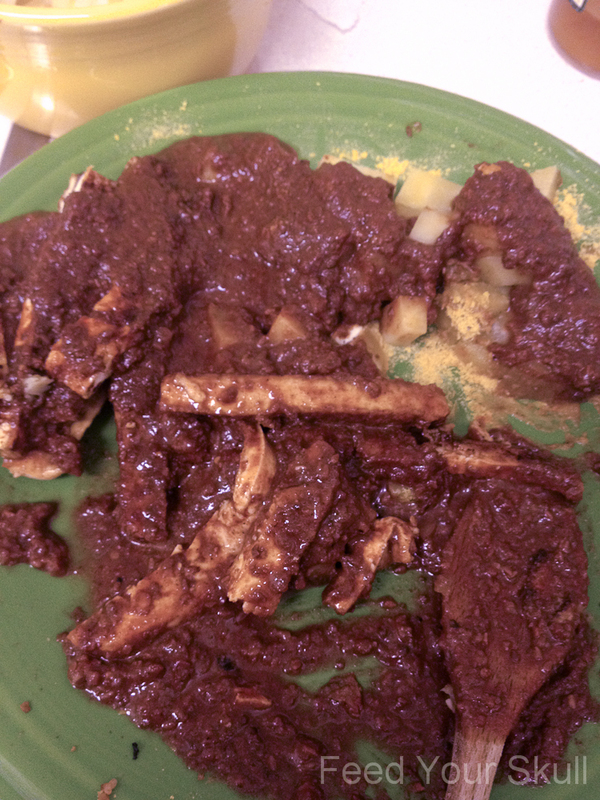 Add your mole sauce to the tofu and potatoes and gently toss to coat. 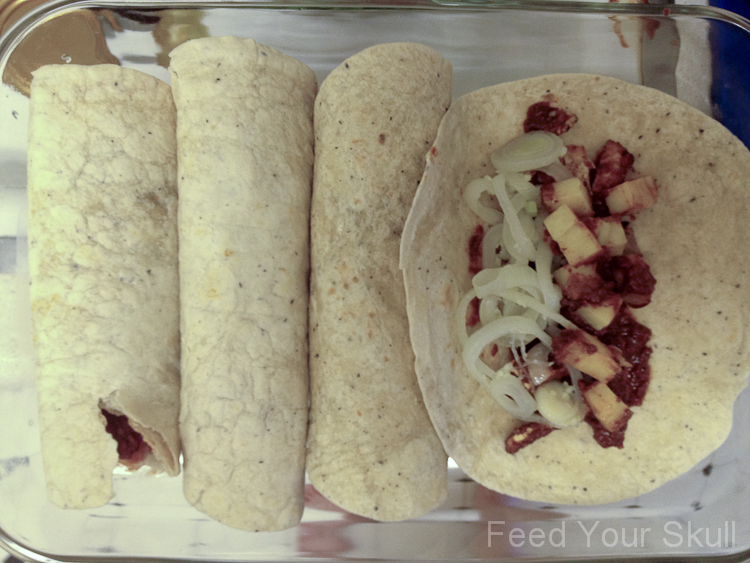 Preheat oven to 350F and grab your tortillas and a 13×9 glass baking pan and start filling your tortillas with ingredients. I started with a little tofu, potato, a couple spoonfuls of tomato, and some onion slices. Roll them and turn them seam side down in the pan. Repeat until pan is full. 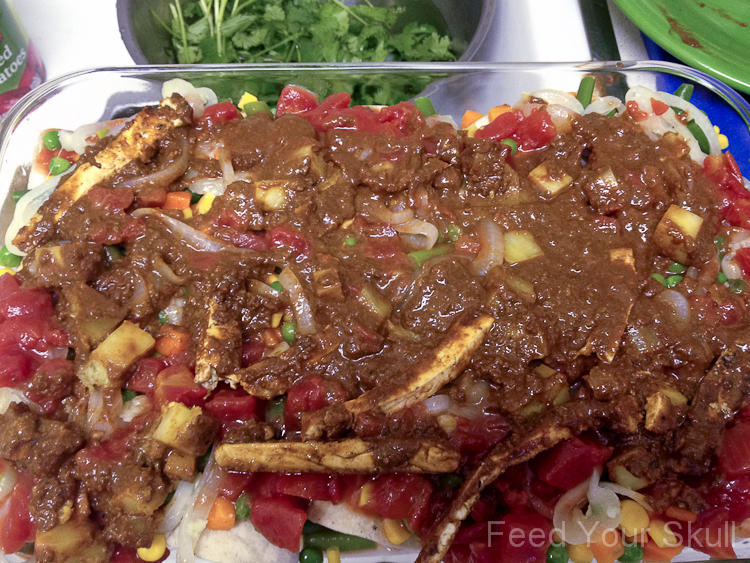 Evenly top with your partially thawed mixed vegetables, the tomatoes/tomato juice, any leftover potato, any leftover onions, and any leftover tofu and mole sauce. Remove from oven, allow to cool if patient enough and devour! 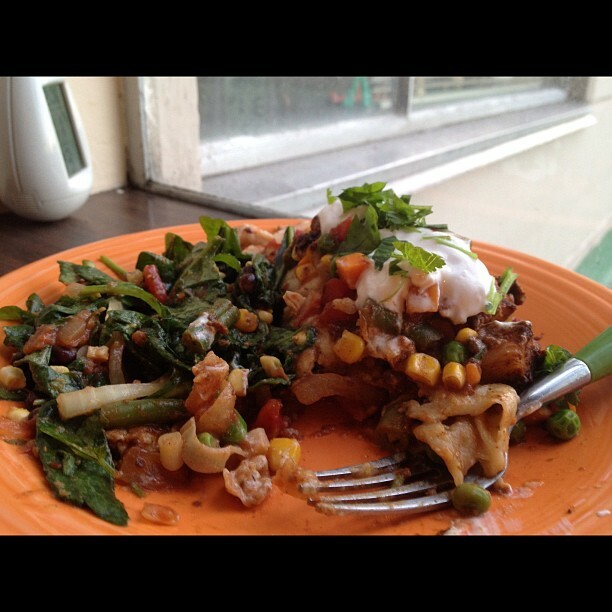 Oh and garnish with cilantro and tofu or cashew based sour cream. 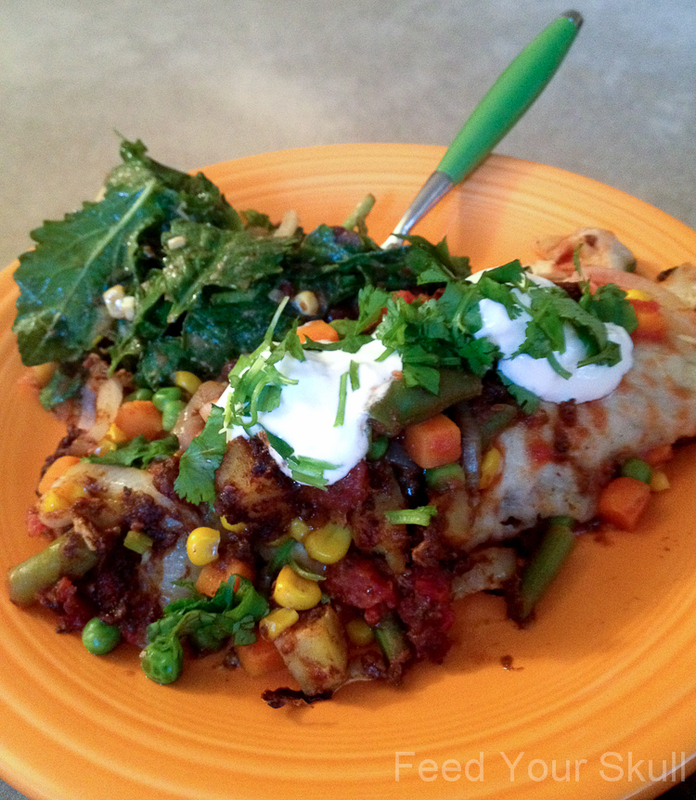 Do you have a favorite way of making enchiladas? 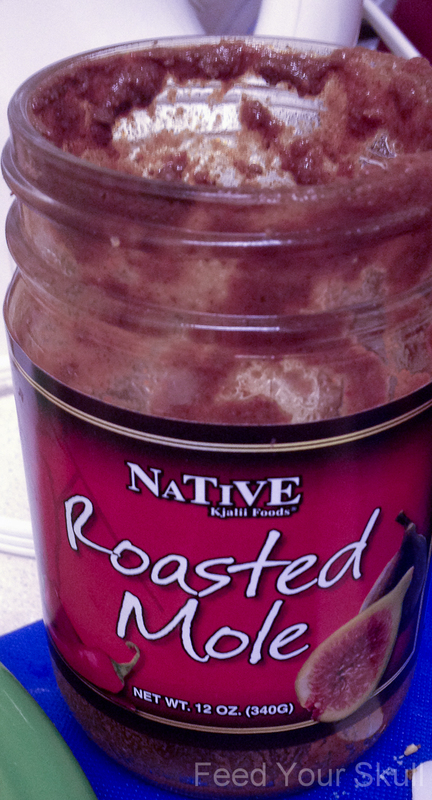 or your own mole sauce? Do tell!